If recent columns on encouraging White House, Departments of Labor, Transportation and Treasury, and the Environmental Protection Agency actions haven’t made the case, here’s another reason for concrete interests to respect President Donald Trump: He is versed on one of the principal value propositions of cast-in-place, precast or masonry load-bearing assemblies. 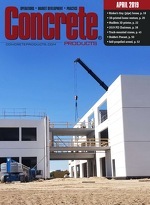 Ready mixed and manufactured-concrete producers have enjoyed gradually improving business for much of the past five years. Like employers throughout the economy, many have encountered a tightening labor market, culminating with 2018 unemployment levels approaching 20-year lows and industry-wide prioritizing of recruiting and retaining production and delivery talent.